A pictures worth a thousand words! you can never make another FIRST IMPRESSION! 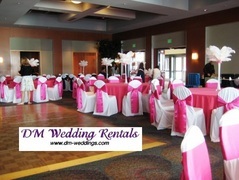 We offer HIGH QUALITY chair covers and linens for an AFFORDABLE PRICE. Unlike any other wedding rental store, our focus is on the small things and those finishing touches!